Thanksgiving is fast approaching ... which means turkey, stuffing, and this beauty chick's favorite, cranberry sauce! 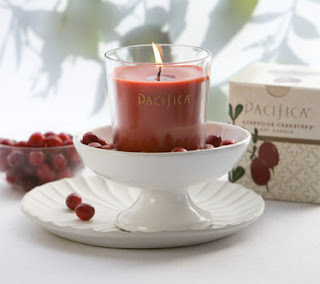 And candle company Pacifica Candles must have known this when they created what I believe to be their most intoxicatingly wonderful candle yet, Seabrook Cranberry. My love affair with this beauty started as soon as I saw the box, covered in succulent cranberries just waiting to be plucked off the vine. The first whiff I drew in upon opening the box was instant magic -- the candle smelled so real, I half-expected my mother's cranberry sauce to magically appear before me! Even better, all Pacifica candles are hand-poured -- this one from vegetable-based soy wax -- and they last for such a long time! It's almost a shame to burn the candle now, while there are still almost two weeks until Thanksgiving. But hey, I just can't help myself! This product is no longer available, but you can find many other amazing scents at pacificaperfume.com.